"In town you're the law, out here it's me. Don't push it. Don't push it or I'll give you a war you won't believe." Watching First Blood for the first time in 16 years, it dawned on me that I had watched this movie far too many times as a youngster. I began to notice that with each passing scene the dialogue and the shot structure seemed all too familiar, almost as if I was greeting a long lost friend rather than viewing a motion picture. While this time around my critical side was able to pinpoint countless flaws that went by unnoticed in my youth, I was yet again struck by the essence of this film's allure that I experienced over a decade ago. Though it is light years from perfect, First Blood still succeeds at providing engaging entertainment. David Morrell's novel of the same name has been tastefully adapted for the screen. While the novel portrayed John Rambo as an out of control psychotic who killed countless numbers of innocents, screenwriters Michael Kozoll and William Sackheim significantly toned down this aspect for the film. Sylvester Stallone additionally penned several re-writes of the script in order to ensure that his character was one with which an audience could empathize. Sure, the story of a one-man army is far-fetched, but First Blood still roots itself in firm believability. The idea of a Vietnam veteran who is forced back into a self-defensive combat status by none other than law enforcement conveys a simple yet profound message on the debilitating effect that an unappreciative society instilled upon these disillusioned soldiers. 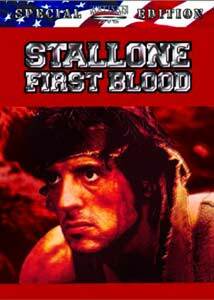 First Blood was the dawn of a franchise that skyrocketed leading man Sylvester Stallone into super-stardom, and, ironically, could have been responsible for the demise of his career as a well regarded actor. Yet, unlike the second and third Rambo films, Stallone gives an impressively restrained performance in this first installment. He manages to combine the quiet, everyday man quality he displayed so admirably in Rocky with the guts for glory action gusto most often seen in his later pictures. While not a great actor, Stallone carries a silent presence that rarely delves into over-the-top machismo. It could be said that it is what he did not do rather than what he did that makes his performance here impressive. I could go on about the other predominately banal performances, but a movie like this does not exist for the sake of dissecting such details; it exists solely to entertain its audience with spectacular action sequences. On this level, First Blood delivers. Particularly impressive is a nighttime hunt through the gloomy fog of a mountain terrain. Director Ted Kotcheff and cinematographer Andrew Laszlo have crafted a moody and atmospheric visual style for this sequence that adds significantly to the tension of the chase. During this sequence, notice the way in which Rambo cleverly wounds his pursuers instead of killing them. This proved to be an incredibly tasteful device that heightened the sense of action rather than nullifying it as the later Rambo films did with seemingly endless death tolls. First Blood begins as a survival story but ends as a story of revenge. This turn may seem a bit awkward at first; however, the screenwriters have tightened the screws and ended the film with a John Rambo narrative that elaborates his final psychotic episode. While this speech proves crucial to justifying Rambo's actions, ironically, this elaboration becomes the movie's weakness; Stallone's quiet nature is fatefully compromised as he over emotes during the speech. The nature in which he dictates his tale of woe is neither harrowing nor emotional, but instead, rather ridiculous. The filmmakers had noble intentions in ending the film with an emotional political statement on the war in Vietnam, yet this proved to be a misstep for a movie that roots itself in action extravaganza; a format it should have maintained throughout. This flaw combined with the horrendously cheesy closing song (sung by Dan Hill) nearly destroyed the integrity of the entire presentation. Awkward moments and lame pop ballads aside, First Blood still packs a wallop 20 years after its initial release. Whether watching it for the first or hundredth time, it is an undeniably stylistic action film establishing the roots of a character that later became an American icon. It was great fun revisiting this first and best installment in the Rambo trilogy. Image Transfer Review: I am very impressed with the obvious restoration effort of this 20-year-old classic. The picture does show signs of its age, appearing mildly soft and dingy throughout, but otherwise there are no major distractions. The 2.35:1 anamorphic image is completely free from film flecks or blemishes, and I noticed no signs of shimmering, even within fine details. I expected quite an amount of pixelization to occur within the abundance of thick bushes, leaves, and rock patterns, but signs of it are negligible. Color, at times, appears muted and there is often an orange tinge to the picture, yet these abnormalities appear to be source-related rather than a problem with the transfer. While not as stunning as one might see in a more recent film, black level is commendable for a film of this age; I noticed only a few incidents where black appeared slightly gray. I believe this is as good as First Blood could possibly look on DVD. Kudos to a job well done. A pan & scan version is also available on side B. While the quality of the image rivals the widescreen version, all of the panoramic visuals are desecrated. Stay away! Audio Transfer Review: The original Dolby Stereo soundtrack has been subtly remastered for the 5.1 format. Purists will be pleased to hear that aside from some added LFE for the explosions, there appears to be little to no sound effects added to the original mix. Both DTS and Dolby Digital 5.1 tracks are offered, but I can honestly hear little difference between the two. The mix exhibits wide stereo separation and is oftentimes fully enveloping. While the action frequently remains locked at the front of the soundstage, surround use occasionally creeps through for ambient effects. The dialogue lacks the natural depth I have come to expect from more recent soundtracks, but every spoken word is clean and clear. When the soundtrack reaches its peak range, it has a tendency to sound slightly strident, yet thankfully distortion is kept to a minimum. The only major irritation I could find was a faint buzzing noise during moments of extreme quiescence. This is a noble remastering effort that proves to be a tasteful upgrade of the original soundtrack. A Dolby Surround track is also available, for those who must come as close as possible to the original sonic experience. The 5.1 tracks are preferred. Extras Review: While the majority of the extras for the Rambo Trilogy box set are contained on the bonus disc, Artisan has included a classy collection of extras on each individual disc as well. The special features on First Blood begin with a terrific feature-length commentary by author David Morrell. My initial fear was that Morrell would dwell on a discussion of his novel rather than the actual film, but I was pleasantly surprised. The well-spoken author dictates a track that rivals the most interesting commentaries I have heard by veteran filmmakers. I was especially impressed with his technical knowledge of motion pictures; from cinematography, to shot blocking, to the importance of promotion, he covers it all. Morrell does not forget to cover the story and script as well, and offers a fascinating comparison and contrast between his novel and the finished film. Morrell is quite verbose, and what he is seeing on screen occasionally causes him to go off on a tangent, yet thankfully he never forgets to go back and provide closure to his prior discussion. This is a fantastic commentary by a man who is, even though not technically involved, quite skilled in the art of filmmaking. Drawing First Blood is the type of documentary that I normally find very boring, yet this collection of interviews proves to be a rare exception. The many interviewees candidly discuss the project from its initial conception to the unique promotional campaigns. Many interesting facets are revealed about the behind-the-scenes difficulties as well as of the film itself. Particularly interesting is the discussion and still photographs of an alternate ending that could have been much more effective than the one used in the final film. Drawing First Blood is an excellent documentary that held my attention every step of the way. Both the teaser trailer and theatrical trailer are very raw presentations. Their dirty aesthetic further heightens my appreciation for the restoration effort of the main feature. Several questions popped into my mind after viewing the trailers, such as: Were trailers always this generic? Are they still this generic? Will we look back in 20 years on modern day trailers and find them as corny as I find these to be? Rounding out the special features is an interesting set of production notes, along with extensive biographies and filmographies for the cast and crew. Easily the best of the bunch, First Blood has aged well over the past 20 years and still provides rip-roaring entertainment. The new anamorphic image transfer and remastered 5.1 audio tracks are wonderful spectacles to behold and should have fans delighted.